grandma's cookie jar: Keep Focus & Give with WorldHelp's Gifts of Hope! Yesterday I wrote about how it is easy to get distracted from the most important thing we can do as grandmas - and grandpas and moms and dads . . . point children to God. While there are many things we will do which matter, nothing is more important than helping the children we love know how to know, love and walk with God all of their lives! Today I want to share a way you can help them keep their focus on God and His love for them during this busy time of year. If you are like me you already have Christmas gifts for family members sitting in your closet and have a list made up in your mind of the items you still need to get. I LOVE giving gifts to people, so Christmas is clearly one of my favorite times of the year! However, along with giving gifts to my family, I also am making a point of involving my young grandsons in giving gifts to others. One thing we are doing again this year is to take time to select items from WorldHelp's Gifts of Hope Catalog (our favorite is two bunnies for $20), so children and families around the world who are in need will be able to receive special gifts this year . . . and most importantly, learn about the Best Gift ever; Jesus! Vernon Brewer, the founder of WorldHope, has the following to say about their Gifts of Hope catalog, "Our brand new 2013 Gifts of Hope catalog is hitting mailboxes around the country and online now! This year’s catalog features brand-new gifts whose impact will reach further than ever before. And we couldn’t be more excited about this year. Here’s why . . . In 2012, Gifts of Hope supporters reached children, families, and communities with the life-changing power of hope. They gave clean water to communities losing the battle against water-related illnesses. They provided mosquito nets to children unprotected from malaria. They empowered single mothers with vocational degrees . . . and so much more! In 2013, we want to do it all again. Only this time, we’re going bigger and pushing harder. And you’re invited to join us! 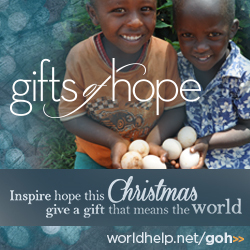 Check out your copy of the Gifts of Hope catalog and start dreaming of how you and your family can transform lives. There’s no limit to how many people we can reach—there are millions waiting for hope! While you browse, don’t forget to check out the new additions to our collection of international merchandise. From vibrant hand-knit scarves woven in the Himalayas to brightly beaded traditional African necklaces—you’re sure to find a gift for every family member. And the best part? When you choose from any one of these gifts, you help support the livelihoods of skilled craftsmen all around the world. We can’t wait to see what we’ll do together in 2013 through the power of hope." So, will you join me in involving your family in sharing gifts which will make a true and lasting difference? Sit down with your grandchildren and select a gift they would like to give. Then help them choose a couple projects they can work on to raise the money for their gifts! Yes, as children they will think about the things they would like to receive this Christmas, but with Gifts of Hope you can help them also focus on the gifts they would like to GIVE to children and families around the world!